Is the same true of all sh species? Last year, I planted a hazel tree in a nature reserve. The ethos is to let nature do as it will undisturbed. This year, I was considering planting an Ash. I like the eco system that grows on, around and is sustained by Ash. Maybe I should choose a different tree? In Austin, all Ash have similar growth characteristics. Depending on where you live, this may be different. If you aren’t from Austin, I can’t really give you quality feedback because regional difference are significant. I’ve got a mature arizona ash about 12 feet from my foundation. That part of the foundation sank 3.5″ during the drought in Austin Texas last year. My insurance company says it’s the tree’s fault, by sucking the water from under my foundation. But I just had an arborist come by and say it’s root ball isn’t big enough to have affected the slab. My rule of thumb is to try to keep trees at least 15′ from the house. Ash trees have extensive root systems that are very close to the surface. Often their roots protrude from the ground. Normally, when I see a tree’s roots damage a foundation, it is lifting the foundation, not causing it to sink. Blaming the tree for a sinking foundation seems suspicious to me. You should definitely check with a foundation expert. Feel free to send me a picture if you want some more specific feedback. One more thing…although it’s a mature tree(~20 years old), it’s been hacked up pretty good. It’s got three main limbs about 15 feet high, but were cut improperly a long time ago and are rotting…so it’s only about 20 feet high total including all the little scrubby limbs. Also, it’s encased in a 1 foot retaining wall, so I think the root ball is actually above ground. I doubt the root ball is a major factor in your scenario, but I’d have to see it to be sure. Our Arizona Ash is 25 years old, we have it pruned regularly and fertilize it and it is in good health. We are in Arlington and have gotten many comments on how nice a tree it is. We do have the large roots coming up. However, this year especially, it is dropping messy gooey seeds or something all over the driveway, cars, roof, etc. I cannot get it cleaned off the driveway with a hose although it partly comes off the cars with a hose. Can you advise me on how to clean up after this tree and what is going on? Thanks. It could be sharp shooters or leaf hoppers, but I have to see it to be sure. 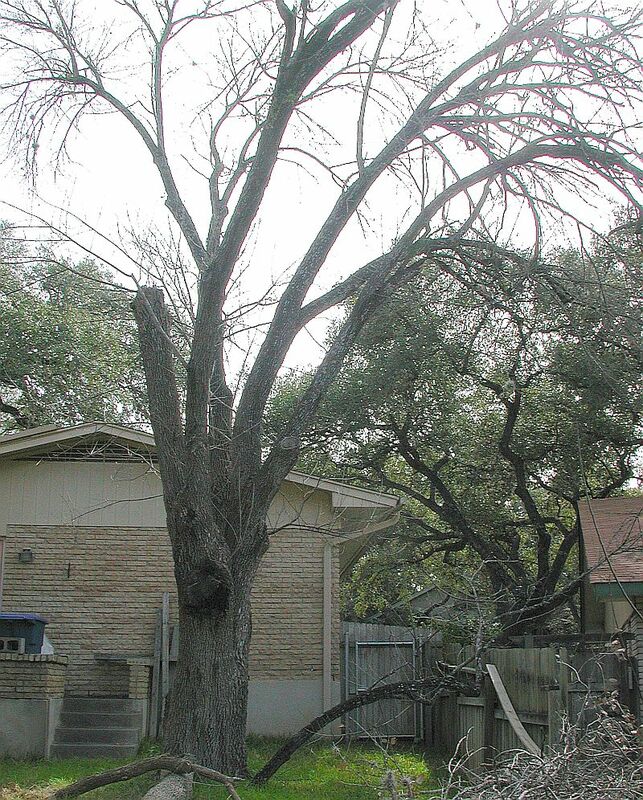 If you are in Arlington you might call Arborilogical or Preservation Tree Care. This sounds like the same problem I had with our trees in my front yard and the problem we had was Aphids. If you look on the bottom of the leaves there will be like small yellow eggs and a white sticky substance. The sticky substance is what is falling on your driveway and vehicles. We had to have an exterminator come out and spray our trees to get rid of the Aphids. Since it is the first of spring I use the Bayer Advanced Tree and Shrub around my trees instead of having an exterminator which has controled the problem for me for the last three years. It is possible that the spray you used earlier in the spring has worn off and white flies are moving in again. You’d have to look at the residual effects on the label of the product you used. Could also be heat stress related; it has been getting hot lately. I might be able to give you some useful feedback if you can send me a digital photo to keith at AustinTreeExperts dot com. Weed n Feed is likely to kill the tree; especially if you just stressed the tree with root pruning. The sprout generation is a natural response. The only thing that is going to slow it down is the healing of the root wounds and improvement in the trees’ healths. Make sure there is proper irrigation and look at the do-it-yourself tree fertilizer post. It will take several years of TLC to get the trees’ healths back to good; if it is possible at all. I live in San Antonio.I have an ash tree.I’m not sure if it’s an Arizona or not.It’s 15′ from the house and we’ve had foundation issues. We’ve also had several large limbs fall over the past 4-5 yrs. and the roots are sticking up out of the ground.The tree has been “trimmed” but not by a “good” arborist.The tree is probably 25-30 yrs. old.Pruning it only seems to promote sucker growth on the tree and at the base of the tree.I’ve had several people tell me it’s reached it’s maturity and should be cut down.What do you think ? Sounds like a bad situation. If its been poorly pruning, located near the house and 30 years old, then, yes, it is probably time for the tree to come down. Can you upload some pictures for me to look at? I have 2-3 large roots running through my yard. I plan on resodding my yard with grass, would cutting these roots kill the tree? Also my house is 28 years old and these two trees in the back are 10′ above the peak of my roof, are they “done” living? If they are alive, they are not done living! It is possible to prune roots without killing the tree. Fall is the best root pruning season. Can you send some pictures that show the roots. If they are really big roots and you cut them too close to the trunk you can get into real trouble. Hola toda la gente que tienen estos maravillosos arboles.. yo vivo en san antonio tx y aqui se ve mucho tipo de problemas con los arizona ash, pero el punto es que la gente no les da el cuidado que requieren y de ellopues derivan todos esos problemas.. he visto algunos que tienen mas de 40 anos y estan en excelentes condiciones, claro. la gente los cuida como debe.. otras personas los tienen abandonados, sin regar, podar o fertilizar.. asi cualquier arbol esta en condiciones deplorables..
Convengo. Esto puede ser un árbol muy bueno si usted poda y fertiliza correctamente. Es muy importante tomar el cuidado apropiado de los árboles de ceniza de Arizona. hello,ihave a couple of arizona ash in my back yard possibly 12 to 14 years old and i noticed the leaves started to fall off early september now theres only a few green spots left .do you know a good arborist who can help save my trees i live in kyle tx, i think they’re dying and i dont want to loose them. You are better off not trying to fill the cavity. Check out this article about decay. Predicting exactly how long a old dying tree will last is like throwing darts in the dark. It’s all guess-work and luck. Definitely look at starting a fertilizer regimen. Here is a good article to fertilize the tree yourself. You can also read about the tree fertilizer programs we offer. Hi I live in southern Arizona. We bought this house newly built 28 years ago and our az. ash tree came with the landscaping. We love it for its shade for our dogs and house. Unfortunately we had a very severe freeze in Feb and we think it damaged a good portion of the outer limbs of our Ash. We want to prune back any dead branches but are not sure how severe we can go and not damage it any further. It has put out buds out early in past years and survived late freezes by dropping the buds and producing new ones. It has not done any budding at all this year and we fear we may have lost it all together! Any advise? We are dearly hoping to hang on to it! The best thing to do is wait. Don’t do ANY pruning until May or June and only remove deadwood. Hi, I live in the Fort Worth area. My house was built in 1978. I assume my Ash tree is about the same age. I’ve had to have it pruned every other year since I bought the house in 2005. This was due to power lines. It’s budding very slow this year, other than the sucker limbs. My neighbor down the street has one that’s already full of foliage and beautiful. Any suggestions? I can send you a picture. Feel free to end me pictures to keith@austintreeexperts.com. Your ash is old and if its been pruned every year, I’m sure it is having problems. You may be losing it. I bought a house last year with a mature Arizona ash. Its leaves came out only partially and everyone told me to water. After months of watering, it looks better this spring. But I’d say about one-third of the branches never leafed out. Is this the beginning of the end for the tree. Should I prune dramatically to get rid of the branches. Are they dead? Could they come back next year with more watering? I have a tree that sprouts all over the place in mass quantities. I have been fighting these sprouts for years. They are fast growers and some of them have gotten to big and turned into full grown trees. I really don’t want these tree sprouts all over. I don’t know the name of the tree. Is there a systemic or something? How do I kill it? You can’t “kill” them. Unfortunately, these sprouts are connected to the parent tree, so if you kill them, you’ll probably kill the parent tree, too. There might be too much soil around the base of the trunk. Make sure the root flares are exposed properly. You can also try digging down and pruning out any roots that are producing the sprouts. It’s a lot of work, but the only way to slow down the sprout growth without killing the tree. I have an Arizona Ash that I bought 2 years ago. Last season it was beautiful. This season there are just dead branches and has not sprouted new foliage. But it does have life, as there are these little green grass like sprouts all over it. I thought this was new growth but it’s not getting any bigger? I have several Arizona Ash trees, one of the trees has always had clumps of seeds during the summer. This year half of the tree is dieing but the other half is green and growing. Alot of green sprigs are coming out on the trunk of the tree (I keep these cut back). What could be wrong with the tree and should I cut all the big dead limbs off? I live in central Texas. These trees are about eight years old, I trim back the low limbs every year but other than that I’ve never done any major trimming. Please help me. Help! I got a brand new AZ Ash tree. The nursery person dug a very deep hole, fertilized and watered the tree and told me to water it for 20-30 minutes a day. I have been doing this faithfully. I live in AZ and it has been 100+ degrees every day since the tree was planted 1 and 1/2 weeks ago. The tree is loosing almost all of its leaves. What am I doing wrong….what should I do? I transplanted an AZ Ash about 6 months ago (rescued it). It is 12′ tall with a trunk of about 3″. Until last month it was doing fine, regular water schedule etc. Now, all the leaves are brown and dried up. The larger limbs are not brittle but the small ones are. Have I lost the tree? Hoping not! Thanks for any insight and suggestions! My husband and I just bought an arizona ash tree today, I was wondering is this is a good time to plant it? I have 7 mature AZ ash trees that for the most part timely trimming and water goes a long way.I seen how easy it is to kill one if you over prune one.The former owner heavily trimmed that died with two years,my neightbor almost lost a 20 year old tree the same way .Over all my trees are beautiful and give a nice shade with disfuse light that does not kill my St.Augustine grass. I have two Arizona Ash Trees in my front yard, which were planted Spring 2003. I live in SE Arizona at about 4200 ft. elevation. As you stated they have grown fast. I have not regreted planting them they are beautiful trees and have given me no problems thus far. I do not consider them a trash tree. All trees have their positive and negative sides. They have become a haven for the birds that visit my yard, and I welcome the shade that they produce. So far I have not had a probem with limbs and such. Thanks for your comments and suggestions on care. I have a Arizona Ash in my backyard and it has been a real good tree. This spring when the new leafs came out, I notice that most of them are being eaten by some thing. Any suggestions? stephen, what does the damage look like? Sometimes leafcutter bees cut circular holes out of the leaves for their nests. although I’m not Steve perhaps you can help me. My tree has leafcutter bees which I have not been unable to get rid of….any suggestions? My AZ ash is only 3 yrs old and this year it has some kind of disease that curls the leaves and forms a sticky white powder. I don’t know how to treat it. Not sure if its a bug or fungus all the leaves are becoming sticky. Appreciate any advice you can give me. I live in texas near the coast. Keith, what’s wrong? I live in Phoenix Arizona and have an Arizona Ash about 15′ tall. It has been doing fine for years until this year. I noticed it wasn’t blooming this spring and had little like spiders on it. I sprayed it and they all died but when it started to bloom the leaves were small and in clusters, like balls of cotton. My tree looks like a “French Poodle.” I do have a drip system which goes on every 7 days for 1 hour with 4 drip heads @ 2 gallons and hour. Other than the poodle issue the tree seems to be fine. What’s wrong??? My AZ ash tree is about 25 years old. Shades most of my yard. This year it is doing nothing but droping seeds. These little things stick like needels. We had seeds before but not like this year. What is the solution to this problem?? Would heat to cut it down and lose my shade. My AZ ash is loosing leave tree is on the main arm of the tree. I have not been watering much. The tree is 23, I have been prooing. Left town this summer and was not watered well—–cut it down or can it be saved? We had a killer frost year ago. Trees just are not coming up and show bad growth. Our soil is desert R8B do I need to add more acidic such as coffe grounds, nitrogen? They look like DOG! My Arizona Ash is budding out alot, but my husband has cut it all the way back. Will this tree branch out and get buds again or did he kill it? My Arizona Ash is over 30 years old. I have never lost a major limb out of it but it does have a lot of dead smaller limbs in it. I do have some surface roots. I planted one in my parents yard when I was in high school. It is probably over 40 years old. I have three AZ ash trees. On one tree after dropping all its leaves and before new leaves appear, there are some droppings of what looks like buds of flowers with very tiny leaves that quickly turn brown. Are these seeds? If not seeds, since the leaves are so small, do you think these make a good mulch for my vegetable garden? We live in El Paso Tx and have an Az ash tree that is about 12 yrs old. Two years ago, we noticed that its roots is destroying our pipes and also ruining our grass. We have broken some of the huge roots. We then thought our only choice is to destroy the tree. However,we do not have the heart to do it. Its a beautiful tree. In total, we have 4 az ash trees. I am wanting to donate them to someone who has enough land that the roots will not be damaging their pipes or land. Thank you. My Arizona Ash trees are 35 years old and each year more and more brances are dying. Is there anything I can do to help them? Hi, my husband suffers from ash tree allergies every year during spring. We live in Arizona and I believe that the ash trees here are Arizona ash trees. We think of following the old method of making a diluted juice out of dried Arizona ash tree leaves and drinking it to see if he can get used to these leaves blooming in spring and him not getting bothered by it. All I want to know is whether these leaves are toxic and in edible. Pls help! I have 2 30+ year old arizona ash trees. They had started to leaf out when we rec’d a very hard freeze/ice storm. It killed the leaves. The tree has done nothing since then. The dead leaves have not dropped off and there is no sign of any green. Are the trees ruined? Will they leaf out soon? Help. Is it ok to cover the surface roots with dirt and grass of the Arizona Ash? My Arizona Ash tree has three vertical splits in the bark which appear to be sapping it’s growth this year. Is there any treatment for this such as a salve to protect the exposed wood of the trunk? I would expect a severe trunk injury to take a toll on the tree’s health. Do you have any idea what caused the injury? If you can post some images I might be able to help. It’s hard to know any details without being able to see them. Can you post photos? I have an Arizona ash. Its been here since 1980. 2 weeks ago I saw webbing beginning in the trunk. Now many branches a nd limbs are also covered. What should I do? We purchased this AZ Ash from a nursery that planted it for us about 2 years ago, and it has shown very little growth. We’ve watered and fed it regularly, yet it does not seem to ever have much new growth on it. Other trees we’ve planted (mesquite, desert elm and desert willow) have really taken off in the same soil as this Ash. Any suggestions? I have a HUGE Ariz-Ash tree in my backyard that my Dad and I planted nearly 50 years ago. I pruned it quite a bit over the years ’cause it was growing into the house, but starting a couple of years ago– in the midst of severe droughts here in San Antone– following a woodpecker attack, 2 great fully green-leaved limbs simply fell down! This past Sunday, another smaller deformed limb about 25″ up fell over as well; most of it was dead already, I think. See pictures. Would ROPING the remaining upper trunks together with a big loop sufficiently contain any further drop-offs? This tree is our principal defense against the blistering summer-afternoon sun and keeps our utilities affordable; it’s too valuable to cut down at this time. Any ideas…? I planted two five foot high Arizona Ash in region 8 sw desert near El Paso. After all this time, care, and hope neither is over 7 feet tall or has even doubled in diameter. One has looks more like a tall bush then tree. What now? dig up and toss? I am one lost tree soul as other trees have gone on well. I have 2 Arizona Ash trees of the same age and size. The have been fine for 2 years since we bought this house. Last summer one of them started to lose leaves while the other one was still strong and full. Now this early spring, the healthy one has tons of buds on it, while the other has only a few. Is this tree dying? I live in Las Vegas. What is causing this, and what can I do to remedy that tree? We had 2 ash trees put in 2 summers ago. They lost all their leaves over 8 weeks ago and as of yet there is no sign of new leaves sprouting. Is this typical? We are snowbirds and are not familiar with the trees here and their cycles. The past 2 falls we’ve come to AZ the leaves on our ash had burnt/dry tips.Is this normal? Thanks. We just had a home built in Marana, AZ and we’re thinking of planting an Arizona Ash in the backyard. How far away from the home & fence should they be planted? Do they require deep watering, if yes, for how long? Is the root growth above the soil line something that can be avoided (I don’t mind the root system showing, I think it adds character but we were planning on putting in fake grass around the tree but do not want the tree to cause damage to the grass later)? Can you possibly suggest another tree that has broad leaves for shading that would be fake grass friendly & we can plant the Ash on the other side. Thanks for your time. I have an Arizona Ash tree that was planted 15 yeas ago, but stopped getting bigger after year 4 or 5. It still produces leaves every year and sheds them in the winter. It just does not grow new branches or bet any bigger. Is there anything I can do to help this? We have a huge Arizona Ash in our front yard which we estimate to be about 40 years old. It cam with the property when we bought the house. We have quickly learned to hate the tree due to it’s constant shedding of something. Seeds, leaves and of course those nasty surface roots at mowing time. We had the tree trimmed when we first moved in and it has improved the health of the tree. But sometimes I am tempted to have it removed. We would hate to lose it however since it shade the house and yard during the heat of the day. I don’t have any particular questions really. Just wanted to put in my 2 cents worth. Remove any deadwood and thin as needed for heavy limbs. Check out some of my fertilizer articles for more details on that. You should consider looking for a certified arborist in your area. If you don’t have previous experience to draw from it could be difficult to make these decisions. I have a Arizona tree in front of my home and I’m worried that it will cause foundation problems .my sons father told him it was going to ruined my Foundation the roots are on top of the ground but I feel it was because the yard was not watered last year when I spent most of my time with my son at the hospital.